The Travelling Lindfields: A bridge too far - or maybe not! Anyone who follows me on twitter @thelindfields may have noticed my profile picture. It was taken a few years ago at Sandy Creek Inlet on Lake Hume. We were cycling the High Country Rail Trail and we hit a snag. 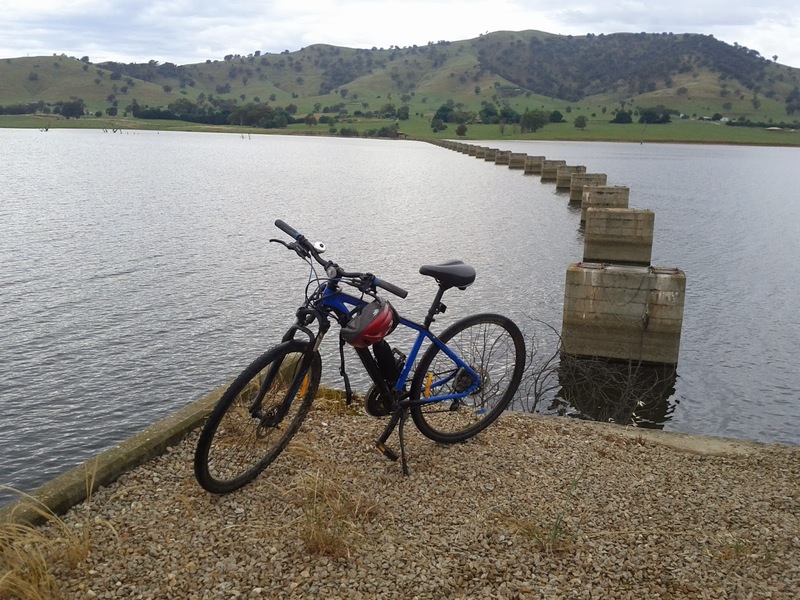 The trail runs from the outskirts of Wodonga to Old Tallangatta along the southern shore of Lake Hume. If you ignored the flies and midges it was a pretty good ride but the detour around Sandy Creek Inlet was a pain and frustrating knowing the old railway bridge pilons were still in place. It made for a great photo op though. Now it's a great ride. If the mystery bridge builders could just come back and eradicate the flies and midges it would be a perfect ride. The trail is 42 kms long. Thirty of those run along the shore of Lake Hume. Tallangatta is worth the short detour. In 1956 the height of the dam at Lake Hume was raised. 104 houses, two pubs, four petrol stations, two general stores, three halls, four churches and several mature trees which now stand in the town's park were literally picked up and re-located. As a result the relatively new town has a charm and atmosphere usually only found in older towns. Of course, my view of Tallangatta may have been coloured somewhat by how welcome the shade produced by the park's large trees were after 30 kms of hot, exhausting cycling.